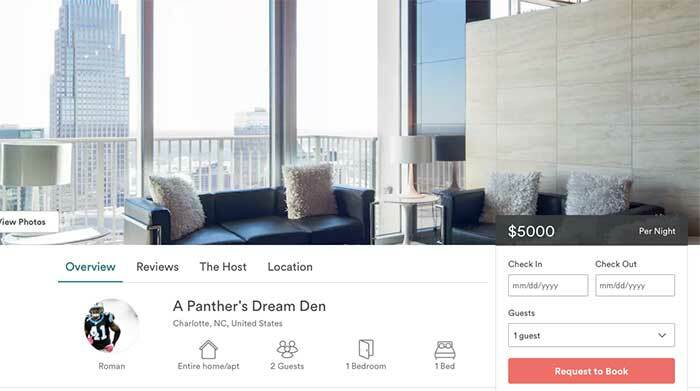 How much money can you make on Airbnb in Charlotte? In the past five years, Airbnb has grown into a corporate behemoth worth more than $30 billion. More than 2 million people spent New Year’s Eve this year staying in one of its short-term rentals. 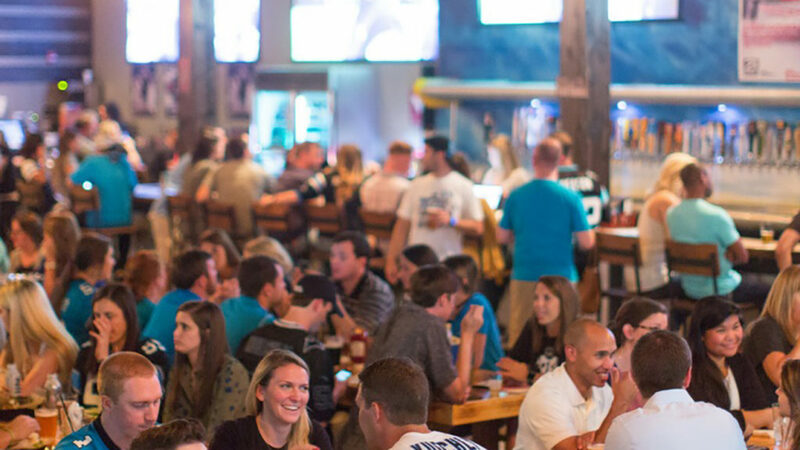 Charlotteans have figured out how to tap into that money in a big way. 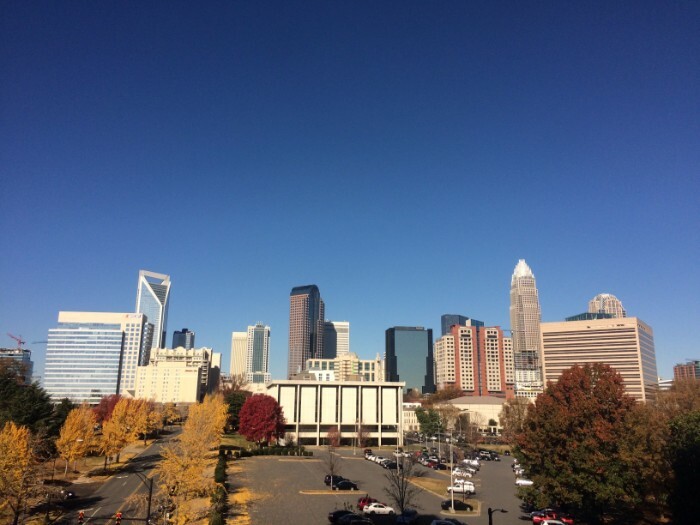 While Charlotte is not a top-tier vacation destination, the city’s Airbnb listings have strong demand both from people coming into town for the weekend and interns wanting three to eight months at a time. That’s given more people the opportunity to try to cover their living expenses on the platform, or even make it a full-time job. It’s difficult to make sustainable. But can you make enough money to earn a real living through Airbnb in Charlotte? Charlotte is the second-most active Airbnb city in the state of North Carolina, behind only Asheville. As of February 2017, there were a total of 687 active hosts in the city managing 832 unique Airbnb properties, according to data firm AIRDNA. The number is booming: A year ago, Charlotte was home to only 356 Airbnb listings. Most of the current hosts — 88 percent — manage only one listing. 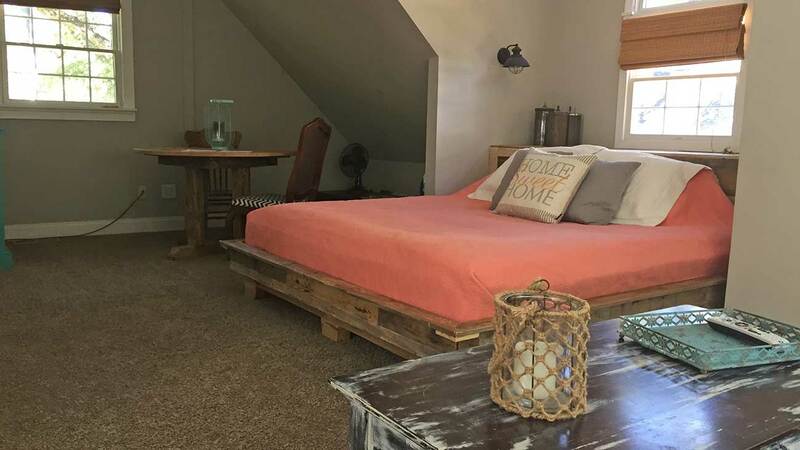 That leaves 83 hosts in Charlotte who manage multiple properties on the Airbnb platform. 225 hosts have achieved “superhost” status, meaning they’ve verified their identity and provided good customer service. Nine hosts in Charlotte managed five or more listings. As you might expect, the Uptown ZIP code of 28202 is the most active, with 139 active listings. 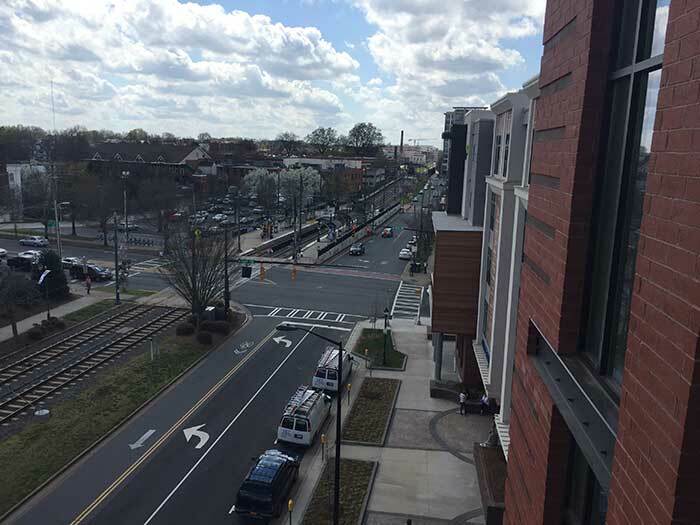 Plaza Midwood comes in next, at 95, followed by the Dilworth/South End ZIP code with 81. Pricing ranges dramatically depending on the day of the week and if special events are in town. But Airbnb guests spend between about $90 and $120 per night for an Uptown apartment on a weeknight, and between $60 and $80 in Plaza Midwood. South End is pricier, generally between $100 and $200 per night. Add about $50 to $75 per night for the weekend. Average occupancy can range from 40 percent to 70 percent, according to AIRDNA. For the most coveted listings, that rate goes up to 80 to 95 percent. Airbnb makes its money by taking a 3 percent cut from the host and charging guests a fee ranging from 6 to 12 percent. So on a one-night $100 rental, the company is making $3 from the host and $6 to $12 from the guest. Can you earn enough to pay your mortgage or rent through Airbnb? While a lot of people list on Airbnb to make a bit of money, some people have slightly larger aspirations. Interviews with Charlotte hosts shows that it’s possible to cover your mortgage or rent through Airbnb rentals — though it takes a lot of work. Kate McGee was an early host in Airbnb, renting out one of the bedrooms in her two-bedroom south Charlotte home and living in the other. For nearly two years, the income was enough to cover her mortgage each month. “I was living there basically for free,” McGee said. More than that, she ended up saving up enough money to make a downpayment on a condo Uptown. She rented that unit out on Airbnb for about seven months, becoming one of the top-rated hosts Uptown, before the condo owners’ association protested. The key, McGee said, is keeping a high occupancy rate. This takes work: McGee estimated she spent about 25-30 hours per week on average. But if you can do that, “You’re going to get more money on Airbnb then you’re going to find in a renter,” she said. But another Charlottean, Anna, had a slightly different — and less lucrative — experience. She asked that her last name be withheld for privacy reasons. Anna was trying to figure out how to most profitably rent out her two-bedroom home in the Wilmore neighborhood. She figured she could earn between $1,200 and $1,700 in a long-term rental, but thought she could bring in $2,000 or more through Airbnb. Between cleaning, interacting with potential guests and keeping an eye on where to price rental, Anna estimated she spent 10-20 hours per week on the project. The spreadsheet below tracks her expenses and revenue. 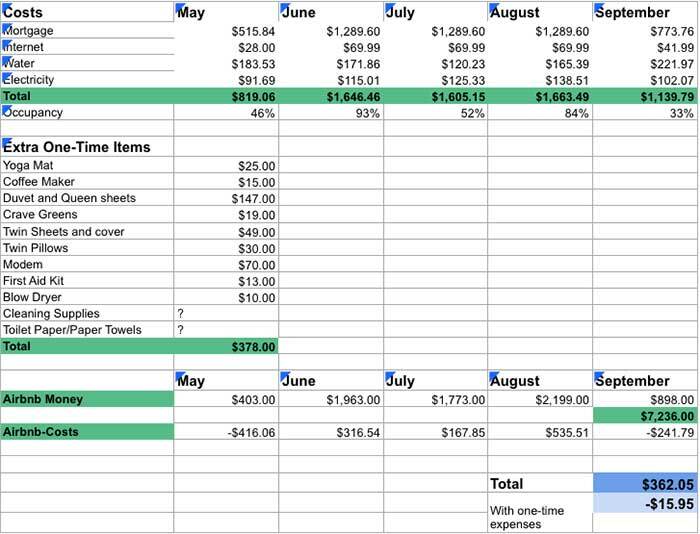 Costs came in at $6,873.95 for that time period. Revenue from Airbnb came to $7,236, for a profit of only about $360. Subtracting one-time costs to get the listing up and running — like a yoga mat, new pillows and sheets — she couldn’t meet her expenses. The experience was frustrating in other ways, too. Some people are OK with breaking even. Villa Heights resident and Airbnb host Justin Gaither said it’s better to think of the rental platform as a way to cover your living costs than as a moneymaker. He said he started renting out his home because he was traveling frequently. “When you factor in all the real costs, you’d be hard-pressed to come out with an actual profit,” he said. Can you make Airbnb a career? Covering a mortgage is one thing. But what about making Airbnb a full-time job? It’s rare, but it’s happening in Charlotte. 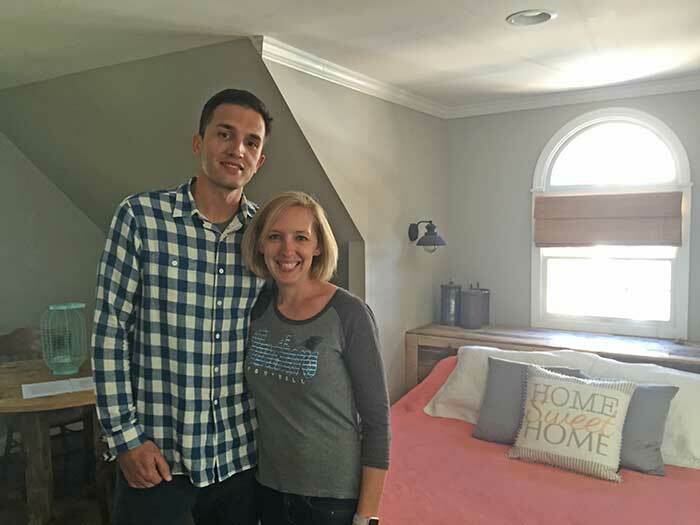 Emir Dukic became an Airbnb host about a year ago when he moved in to Commonwealth Avenue in Plaza Midwood. Their home has a detached garage with a separate entrance and an apartment upstairs. “Having two boys, I couldn’t make it my man cave,” he said. And having no kitchen, it wasn’t viable for a long-term rental. So they decided to list it on Airbnb and see what happened. It was low-risk, Dukic said. The listing took off. After about 8 months, Dukic began wondering whether he could turn this into a true business. That became his new company, Rabbu. The firm manages Airbnb listings, start to finish. He’s taken lessons learned while renting out his own apartment into the venture. The real key to his listing’s success, he said, is the private access. Renters are given an access code they can use to gain entry to the apartment. As the Dukics build their business, they’re keeping that in mind. Consider it a type of property management. Most firms take a standard 10 percent fee of a rent. Dukic’s company has several arrangements, including a flat fee or a percentage of income. Rabbu manages five properties now, four in Charlotte (including Gateway Village, NoDa and Uptown) and one in Baltimore. “We have a proprietary formula to see what will do well,” Dukic said. They decorate the listings to fit the neighborhood and manage it all under their superhost profile. Ultimately, they want to scale across the Carolinas. There are money-making opportunities around the periphery of Airbnb, too. Photographer Gage Beck said the bulk of his business now comes from taking professional photos of Airbnb listings. He works directly for the company, which offers the photos as a service. Beck said he’s traveled as far as Gastonia, Mooresville and Rock Hill shooting listings. The biggest job? NFL player Roman Harper’s home, listed on Airbnb as a promotion enticing people to rent a football player’s home for the Panthers appearance in the Super Bowl last year. Airbnb consulting is turning into a full-time opportunity, too. He gets paid per answer, and said it eventually got to the point where he could earn double his attorney’s salary just by solving problems. 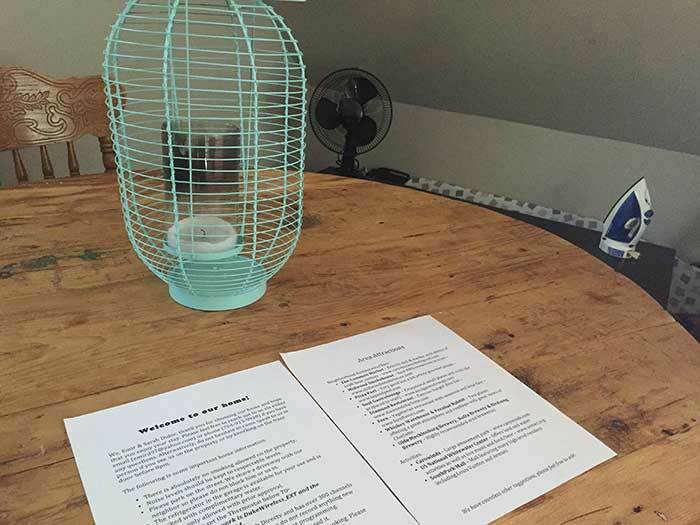 Holman has also started leading SkillPop classes on how to be a more effective Airbnb host, another revenue stream. What makes a popular listing? Of course, to make any kind of money on Airbnb, you need a quality listing. The No. 1 criteria in this market, several hosts said, is location. “The closer you are to Uptown, the better you’re going to do,” Holman said. But beyond that, it’s the little things that count. These little touches matter. Airbnb itself has found that listings offering a hair dryer make an average of $10 per night, all other things being equal. Kate McGee, the south Charlotte and Uptown host, said she always had fresh towels sitting out, alongside a tray with bottles of water, snacks and a bottle of wine. She even created her own guidebook to the city, full of take-out menus, a map of B-cycle stations and the greenway system, and a list of nearby points of interest. Holman said the key is simple luxuries like designer-grade moisturizer and hand soaps. “Create a hotel-like experience without being a hotel,” he said. But watch out, all those extras add up and can cut into profit margins. Anna, the Wilmore host, said she offered coffee, tea, sugar, salt, pepper, olive oil, plastic bags, and a well-stocked kitchen, but didn’t leave any small treats or any welcome items. “I know a lot of hosts do this to try and get good reviews, but I just wasn’t making enough money to drop $10 every time a guest arrived,” she said. Danger ahead: Condo communities are cracking down. As more people try to make serious money on Airbnb, hosts are increasingly wary of a regulatory crackdown. Cities like Chicago and New York have considered banning Airbnb outright. North Carolina offers some protection. The state legislature struck a deal with the company to remit taxes, essentially OKing their operation. They took a similar approach with Uber. Still, city councils have been trying to make life hard to Airbnb hosts. Raleigh has criticized the service. Asheville, too, has been trying to regulate Airbnb out of existence in its city. South of the state line, a traditional bed and breakfast host in Charleston has sued 100+ Airbnb hosts. All that has professional hosts here a little angsty. “I’m now planning for my fourth one, and I’m wondering, do I want to get into it? What if Charlotte bans Airbnb?” said Gigi, a host in Ballantyne and Uptown. She also asked that her last name be withheld for privacy reasons. For now, though, “I think Charlotte is content to let Airbnb do its thing,” Holman said. The real danger, however, appears to be condo and apartment managers. Most condo association bylaws have rules that specify how the units can be leased — typically either 30 days or a year, said Kaytee Bell of CAMS Management Charlotte. That would specifically prohibit the short-term rentals that Airbnb is known for. “Sometimes banks can get really weird about lending in communities like that. It makes financing a little more tricky,” McGee said. But this, too, might give way to the future. Several new townhome and condo projects underway now are being built specifically with the residual income of Airbnb listings in mind. 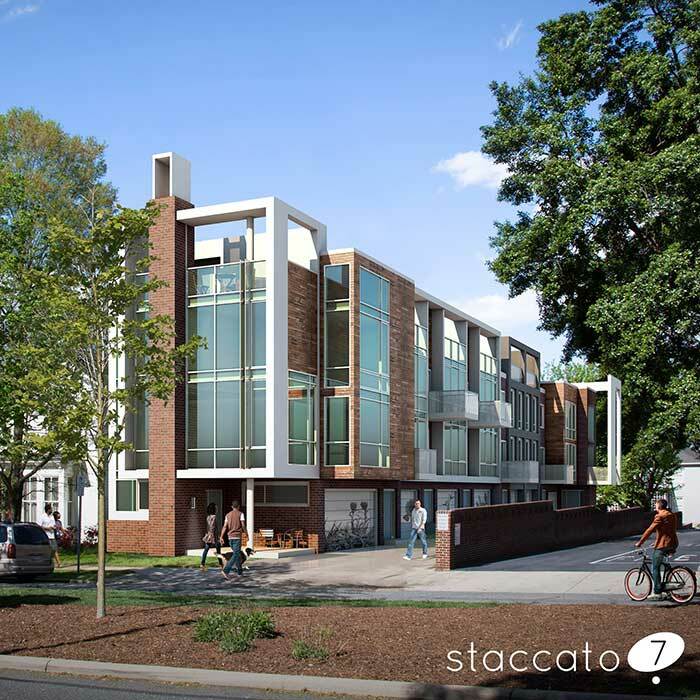 One such project, the Staccato 7 townhomes in Fourth Ward of Uptown, will have covenants that allow for Airbnb listings and features that make it conducive, like remote entry. Pricing is in the mid-$300,000s for a one-bedroom and $500,000s for two bedrooms. 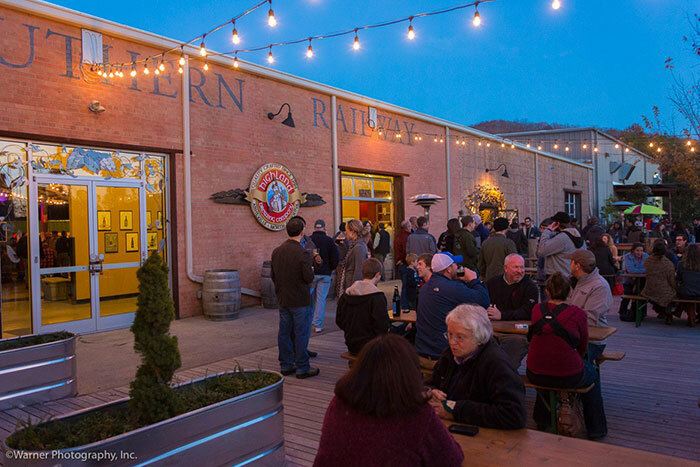 Why aren’t we making friends at bars and breweries?